Tatum Elsea is bracing for the worst summer of her life. After being falsely accused of a crime, she’s stuck under stepmother-imposed house arrest and her BFF’s gone ghost. Tatum fills her newfound free time with community service by day and working at her covert graphic design business at night, which includes trading emails with a cute cello-playing client. If Tatum is reading his emails right, her virtual Prince Charming is funny, smart, and talented—and he seems to think the same about her. But over the course of the summer, Tatum will learn that sometimes going after what you want means breaking all the rules. And when Tatum discovers she’s not the only one in the house keeping secrets, she finds she has the chance to make amends with her family and friends. Equipped with a new perspective, and assisted by her feisty step-abuela-slash-fairy-godmother, Tatum is ready to start fresh and maybe even get her happy ending along the way. When I saw this cover on my Netgalley dashboard, I fell in love. It screamed YA, contemporary and romance, three things I love, and I was very excited when I got my hands on this book. However, I was pretty disappointed when the book was less than exciting. Tatum has been put under house arrest after being charged with a crime she didn’t actually commit. Her dad is away for the summer which leaves her with her way too strict step mother and her way too perfect step sister. Then Tatum has the idea of staring her own graphic design business and a few email exchanges later, Tatum is hooked on a guy she hasn’t even met yet. Is this the start of a summer romance or will Tatum’s cruel stepmother keep her in her castle? Against popular opinion, I have to admit I was not Tatum’s biggest fan. As protagonists go, I found her kind of meh. There wasn’t anything that really drew me into her and I just did not feel connected or enthralled by her story. Don’t get me wrong, Tatum’s enthusiasm for what she did and her ability to change across the novel was lovely but she just didn’t have that wow factor I look for in a narrator. What I did like about this book, however, was the mystery romance. Tatum meets a guy online and they exchange several flirty emails. SK, as we knew him, was funny, sweet and very charming. I was rooting for the pair to get together and praying my suspicions about who he really was were right (I’m not going to lie, this book was pretty predictable). I love a good summer romance and this one was the perfect amount of sweetness. Now I always complain about the lack of family in YA so I was happy to discover there was a whole load of it in this novel. Tatum and her dad had a pretty tight relationship, which I really liked. I’m pretty close to my dad so I love reading books with great father-daughter relationships. Also, Tatum and her stepsister have a very interesting dynamic. We heard hardly anything of Tilly until the last few chapters of the book but I did like what we got to see of her. Of course Tatum’s relationship with her stepmom was also a big part of this novel and it had a very Cinderella-esque feel to it. I didn’t really know what to make of this relationship, I found it a little extreme sometimes and I think the evil stepmother thing was overplayed a little bit at parts. This review is much shorter than I usually do but that is purely because I don’t have much to say about this book. It wasn’t bad, it just wasn’t very good either. Hopefully some of you will have some better luck with it than I did. Christina June is a writer of YA contemporary fiction when she’s not writing college recommendation letters during her day job as a school counselor. She is a voracious reader, loves to travel, eats too many cupcakes. She lives just outside Washington DC with her husband and daughter. 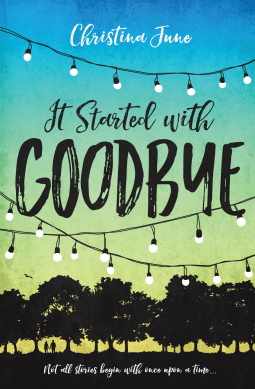 Her debut novel, IT STARTED WITH GOODBYE, will be published by Blink/HarperCollins on May 9, 2017. The cover really is pretty. Welcome to It’s A Reader’s Life. Love books? You’ve come to the right place. Its A Reader’s Life is full of reviews, author interviews, book tags and more! “Bennie, If you can read , you can learn just about anything .” My Life , Ben Carson.